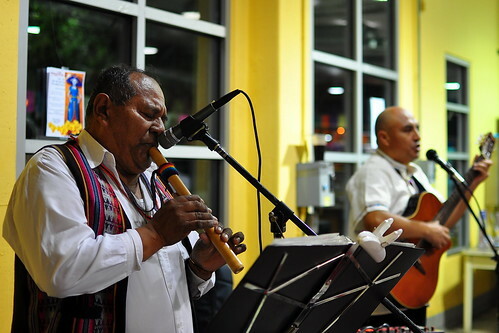 Mo-Chica is a temple of contemporary Peruvian cuisine housed in the Mercado La Paloma, a former warehouse converted into a vibrant marketplace and community center. 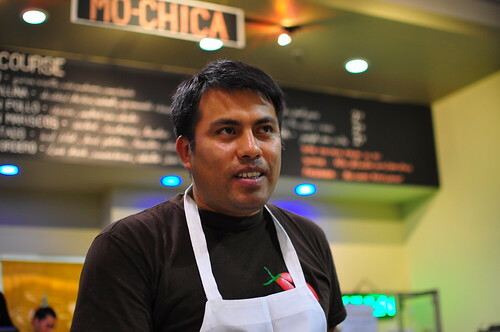 Of the 100+ restaurants I’ve had the pleasure of dining in during my first year living in Los Angeles, it’s Mo-Chica that surprised and impressed me the most. 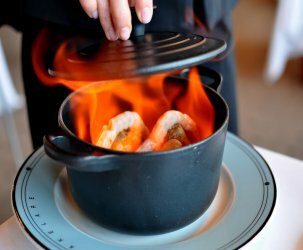 I knew going in that the food would be stellar based on Sir Jonathan Gold’s glowing review, but the meal I experienced exceeded all of my expectations. Lima native Ricardo Zarate, Mo-Chica’s chef and proprietor, churns out food so beautiful and delicious that it could be easily served in a fancy pants establishment at twice the price. 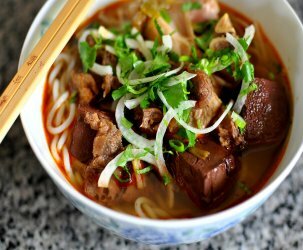 The restaurant’s warm service, kick back atmosphere, and overall quality redefine food court fare, and the city’s dining scene is all the richer for it. 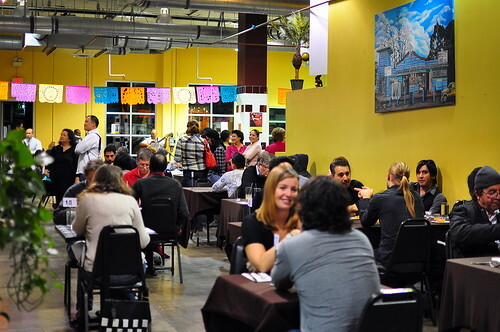 Once a month, Mo-Chica pulls out all the stops (and the linens) for a six-course pre-fixe dinner. I’ve been wanting to attend one of these events ever since reading Ravenous Couple’s enthusiastic write-ups  , and finally had the chance the third time around. I attended the tasting dinner along with Hong of Ravenous Couple, Danny of Kung Food Panda, and Abby of Pleasure Palate. …while the soulful musicians caught my ears. Before the first course arrived, we sipped on aguas frescas. Abby chose the chebada—barley ice tea, ginger, and herbs ($2), while Danny and Hong went for the maracuya—passion fruit juice ($2). I chose the chicha morada—purple corn ice tea ($2). The chicha morada was tart, refreshing, and a deep shade of royal. The six-course dinner was priced at $35, but all four of us dined this evening as guests of Chef Zarate. 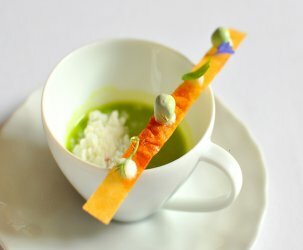 We started with a locro soup made from Japanese pumpkins. 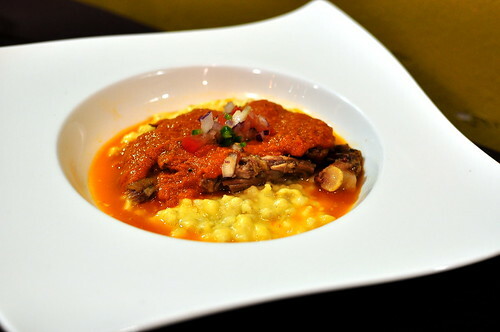 Locro is a hearty thick stew popular along the Andes mountain range. 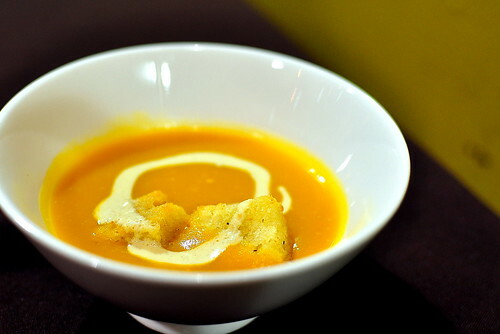 The mildly sweet soup was drizzled with cream and topped with crisp croutons. 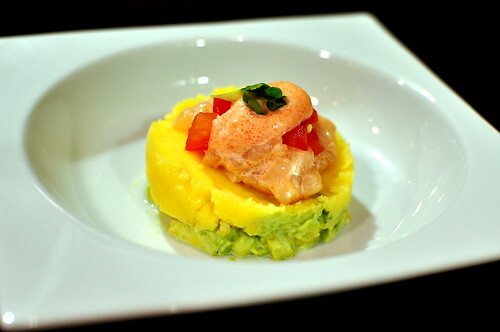 The second course was a causa, a popular dish along the Peruvian coast. The beauteous creation consisted of a layer of creamy diced avocado topped with a layer of chunky yellow potato mash. A luscious pile of dainty scallops smothered in a mentaiko (caviar) was perched atop the potato mash. This dish was seriously phenomenal. 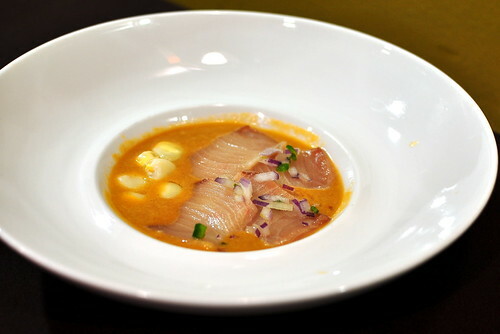 The third course was a tiradito, a Japanese-influenced dish similar to ceviche. The slices of sushi-grade yellowtail rested in a pool of yuzu, tomato, and leche de tigre. The gorgeous cuts of fish married merrily with the tangy sauce. It pleased me to no end when the tiradito was followed by another raw fish course—I love raw fishes because they’re so delicious! 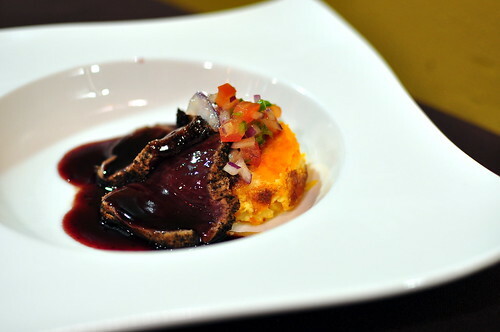 The fourth course consisted of seared bluefin tuna served with a camote (sweet potato) quiche and purple corn reduction. The delicately composed quiche offered the perfect textural and flavor contrast to the buttery slices of tuna. The final savory course was a homey dish of braised oxtail with barley huancaina (a cheesy sauce made with aji amarillo peppers) risotto. It was rich, creamy, and stick-to-your-bones good. 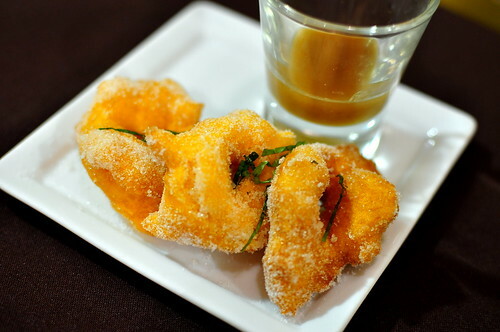 Lastly, a plate of picarones (Peruvian pumpkin doughnuts) with a side of chancaca (unrefined cane sugar) honey dressing. I thoroughly adored the one picarone I ate, but had to pass the other two to Hong and Danny due to lack of stomach capacity. At the end of our meal, Chef Zarate stopped by to say hello. 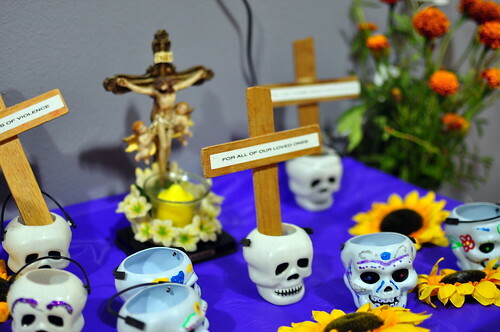 After thanking him for the outstanding feast, we learned a bit more about the talent behind Mo-Chica. Chef Zarate spent years working in London, but eventually moved to Los Angeles after falling in love with the city’s ethnic diversity during a short visit. He began working in Los Angeles at The Biltmore Hotel downtown and currently divides his time between Mo-Chica and Wabi-Sabi in Venice, where he serves as executive chef. UPDATE: I attended the November 19 tasting dinner and left hugely disappointed. The food was nowhere near as fresh and delicious as the one I wrote about and the portions had shrunk dramatically. The tasting featured two fried items, a dried-out halibut, and worst of all, chicken strips! I won’t be back for another tasting, but I would like to return to sample Mo-Chica’s regular menu. Ricardo Zarate, you’re breaking my heart with your inconsistency. UPDATE UPDATE: I have since dined at Mo-Chica two more times for their regular menu offerings and it’s one of my favorite spots in the city. I love the daily ceviche special, quinoa mushroom risotto, and the seafood with rice. The prices are reasonable and the food is so, so good! Wow. 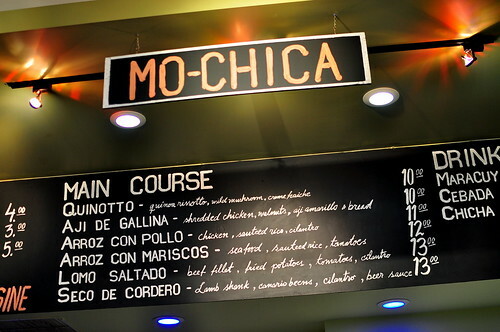 I wanted to go to Mo Chica after reading about it in L.A. Magazine, but your photos make me want to go NOW. wow! and if anyone ever wondered why I love SoCal so much, great weather aside, the dining scene is spectacular. The great weather just makes the eating experience that much more enjoyable. The presentation is another case of where eye candy meets food.yum! Wow…,I was just discussing this joint with a former rose court member today! Wanted to know if she had been, or had heard of, this place! We got more to talk about. Thanks, CD! I want! And it’s so close to me! Pictures are looking super crisp! 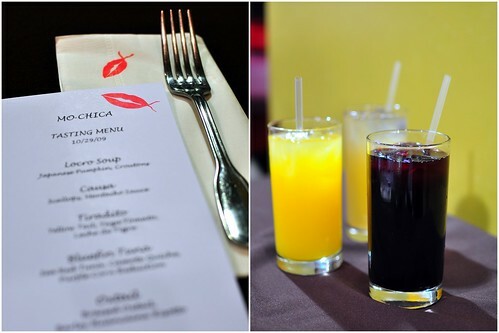 Mo Chica is definitely one of the best Peruvian restaurants in town. I like how the food is both innovative and affordable, possibly one of the best qualities of cuisine in LA (compared to other US cities). Well damn. I know I should have gone with you guys that night. Anybody else wanna go w/ me? I basically agree with your 11/19 update, CD. However, I can’t say I was “hugely disappointed.” But, it certainly was less than what I expected based on your original review. Peruvian food is great, i myself am currently living in Peru at the moment and the food here is spectacular. Ceviche, aji de gallina, carapulcra (like a dried potato stew) and an endless numebr of dishes.i love the seafood in particular and the andean arequipa stlye of cooking (chupe de camarones being my favorite”’it’s like a shrimp soup but really so much more) …i’ve even tried guinea pig in cusco… The places you can visit here as a tourist are pretty cool too; machu picchu, lake titicaca,the amazon, the nazca lines..If anyone is interested in visiting or taking a culinary tour to Peru i suggest //www.perumagicaltravel.com great prices and great service…cheers! !